Download Sprintbit Playlist Manager 2019 setup installer 64 bit and 32 bit latest version free for windows 10, Windows 7 and Windows 8.1. Playlist Manager is an advanced playlist creator & manager. It has a lot of useful features for playlist editing management and playback, including special features like bookmarks, schedulers, statistics. Supports all media and playlist files. 2017-06-11 (173). Malware Test (173): 100% Safe Tested & Virus/Malware Free. Jajuk is a powerful music organizer for all platforms. The main goal of this project is to provide a fully-featured application to advanced users with large or scattered music collections. Instantly stream your favorite music and automatically record entire albums from over 100,000 radio stations as free MP3s. Discover new artists with similar music and complement your music library. Copy music to your smartphone or burn an audio CD. Make your own music with our award-winning voice-to-note music composition software. With Music Masterworks you can compose by just singing into your microphone. Edit the song using piano roll or staff notation with a simple mouse/touch interface. Jolix CD Ripper is a top CD ripping/audio converting software created for all types of users looking to transfer their large music collection of CDs to their computer or other devices of their choice as mp3 or other types of files. Txt2VobSub generates vobsubs[IDX/SUB] subtitles from SRT or TXT subtitles. It is a useful subtitle converter tool. The quality of the subtitles is superb. You can select custom colors and position for your subtitles. A mix between a karaoke and a recording studio, and its FREE ! Convert audio between MP3, WMA, WAV, M4A, AMR, OGG, FLAC, MP2 and other popular audio formats. Export and convert audio from your video files. Create ringtones and audio-books for iPhone. Use a command line mode for automatic conversion process. 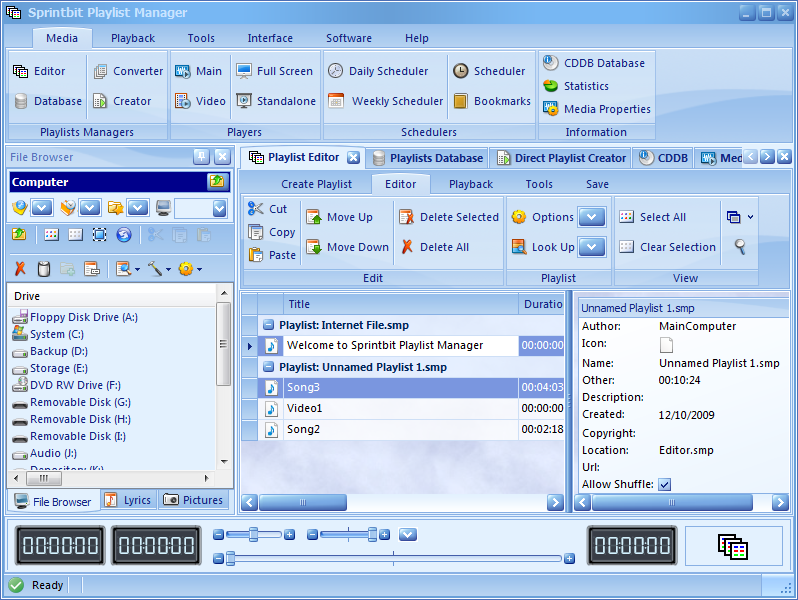 Sprintbit Playlist Manager is a powerful playlist creator and manager with multimedia players. You can create playlist of your favorite media files or Internet stations and use it as your default multimedia player on your computer. Supported playlists formats are M3U ASX WAX WVX WMX WPL B4S PPL SMP PLS ZPL XSPF PLA. All major audio and video files for playback are supported, it can play encrypted files too. The major features are: Playlist Editor for creating or editing playlists and their properties including files locations manipulations. Playlists Database that lets you store playlists source in database, if you lose your playlists on disk you can restore them from database! The software includes few schedulers that let you schedule media playback on at given data and time. With schedulers you can play selected media files partially or in whole, set the separate playback start and finish time for any file. With Daily Scheduler you can schedule your files to be played or executed at given time in one day or in many days in advance. Schedulers may be used at home and for radio broadcasting as well. Direct Playlist Creator feature lets you create playlist in a snap directly out of your files on disk without the need creating playlist manually in editor. Playlist Converter is for converting between varieties of playlist formats. The software has built-in four media players; Media player with own playback playlists, Full Screen video and Standalone Media Player that you can use to play media in a small window while doing something else. Lyrics & Pictures Viewer for MP3 files and associated media files as well. Playback Statistics list for keeping track of your playback. Picture Viewer with slideshow player. File Browser for managing your files on your computer. File Searcher and Media Scanner lets you search for specific media files. You can export playlist to PDF CSV HTM RTF Excel or get playlist from the Internet CDDB database. Multilanguage Interface. Sprintbit Playlist Manager free to download. Sprintbit Playlist Manager 2019 latest version. Sprintbit Playlist Manager for Windows 10, 7 and other prevoius windows versions. How to uninstall (remove) Sprintbit Playlist Manager Completely? Softati.com - does not store Sprintbit Playlist Manager patchs, serial numbers, activation, cracks, license key, keygen or any forbidden files that may cause harm to the original developer. Only free direct download for the original developer distributable setup files. Sprintbit Playlist Manager is developed and maintained by Sprintbit Corporation, Softati.com is not affiliated with this software developers by any means. All trademarks, registered trademarks, product names and company names or logos mentioned herein are the property of their respective owners.